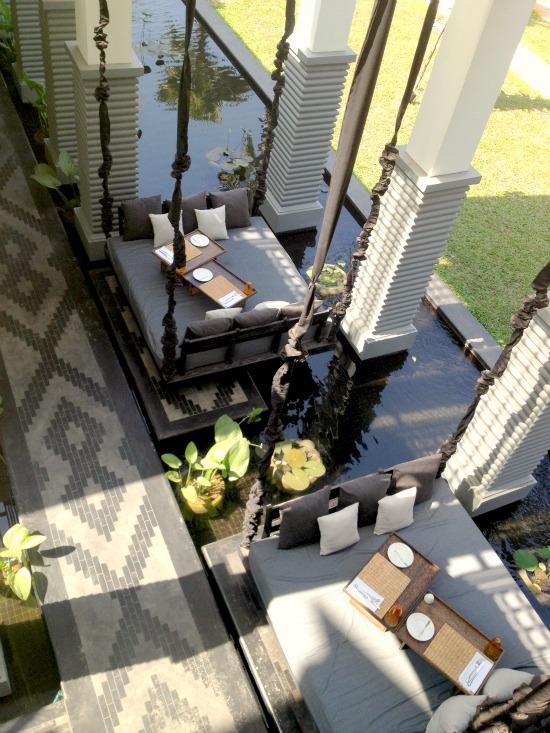 Travel blogger, Jaillian Yehia, from Savoir There shares 5 fabulous places to stay in Siem Reap, Cambodia. Siem Reap in Cambodia is the jumping off point for one of the most awe-inspiring religious wonders of the world – the temples at Angkor Wat. But the first thing the average visitor is left wondering is just where to stay – the ever growing Temple Town is home to a huge concentration of hotels and guesthouses and choosing between them can be somewhat bewildering. Heritage Suites is tucked away in a leafy residential area behind Wat Polanka near the Siem Reap River - but you won't need to know this before arrival because one of the hotel's USP's is available to offer free collection for guests in one of their two super-cool vintage Mercedes, which cause quite a stir as they drive through town. After picking your way through shaded pathways to your private villa, each named after a different tropical flower, you'll be delighted to discover your main problem for the next few days is deciding where to wash - choosing between luxurious basins, an indoor free standing stone tub, and even an outdoor shower in a leafy secluded garden. Or head back inside for your own private steam room if you fancy it? Climbing up the wooden platform onto the inviting bed after a session exploring Angkor Wat is a joy, and the soothing, sophisticated decor makes a perfect cocoon from the heat and dust of the day. As you would expect from a Relais & Chateux property you're every need is catered for from mossie spray on hand at breakfast to cocktails on the legendary Thursday jazz nights, until the moment you climb back into your classic car to be chauffeur driven onto your next location. Frangipani are the leading boutique hotel group in Cambodia – and the stylish villa style 1960's building in Siem Reap is the original flagship hotel, though they now have a second in Temple Town and no less than 4 hotels in the capital, Phnom Penh. Being Khmer-owned and run, a stay at the Frangipani is the perfect way to feel you're part of Cambodian culture without having to give up any of your design pretensions - each hotel is completely unique, with a slightly different design twist, though all very much in a contemporary and minimalist vein, full of colour injections and retro twists. Their environmental and social responsibility credentials are pretty impressive too - from using solar powered hot water and supporting local charities who give bikes to under-privileged Cambodians to sponsoring their Khmer staff's professional development and vocational training it all adds up to a friendly, safe and welcoming base to come back to after a day exploring the temples or discovering the area around the hotel, the enjoyable and up and coming Wat Bo road, home to a range of bars restaurants and cafes. Sofitel's reputation as a French-owned and internationally renowned hotel chain precedes it, but with such a glut of hotels in this part of Cambodia the Angkor Phokeethra isn’t resting on its laurels and makes sure you live the company motto 'Life is Magnifique'. There may be over 200 rooms on this 6 hectare estate, but with more than 5 times that number of trees, the overall impression is one of tropical haven of lily ponds and greenery rather than concrete jungle. 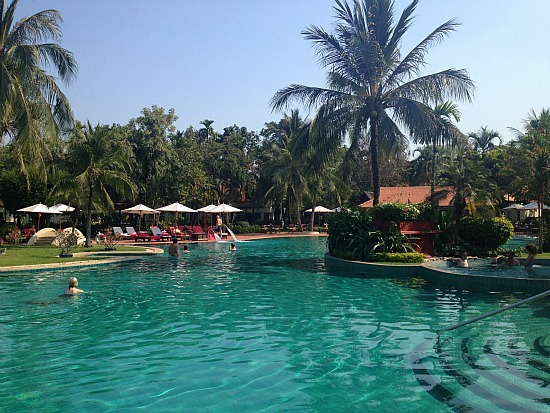 Voted in the top ten child-friendly hotels in Asia, kids can play in the biggest free form swimming pool in Siem Reap while adults might prefer the swim-up bar or L'Occitane spa with sauna and steam room. Services like 24/7 babysitting are on hand too and the colonial surroundings of the hotel make a great place to enjoy Khmer, French and English versions of its refined Afternoon Tea. For literal high fliers you can even swoop in straight from the grounds of the Sofitel Phnom Penh via helicopter - yet despite all this European-style luxury the hotel has a serious interest in the Cambodian community too, working with local organisation Agri Sud to help farmers decrease pesticide use and educate them on diversifying their crops, which the hotel buys at full market value. The average guest comes to stay at Soria Moria for 3 days on their first visit - but returning visitors come back for at least 6 days. It could be the undeniable pull of the Cambodian experience or the warmth of the Khmer people that brings them back to the country for longer the second time round, but the reason they choose to return to Soria Moria has to be attributed at least in part to the connection the hotel offers guests with what goes on in the communities around them. Norwegian owner and manager Kristin Holdø Hansen started this 38-room hotel with a 10 year plan to work with and train her Khmer staff before handing over the business to the 35 staff in the ownership program leaving it fully Khmer-owned and managed - and that process is in full swing. After a stint running a guesthouse and working with land mine victims, Kristin decided she could do more by offering a hotelier's vocational training program to ensure that in the future it is local people rather than NGOs that are able to help other local people here in Cambodia. And while Kristin is passionate about this business model for developing to prevent a foreign dominated tourist industry in a delicately balanced destination, it is entirely possible to stay at Soria Moria without knowing or necessarily caring about any of this. Beyond a booklet in the room and a keenness to share the story with you if you are interested you're free to simply enjoy the large rooms, Wat Bo location, rooftop jacuzzi and $1 tapas nights plus the superior Norwegian grub on your down time after temple visits - where else can you get traditional Norwegian meatballs in Cambodia? Shinta Mani is the real deal when it comes to design hotels - a temple to modernity for those who love art and design housed in what was Siem Reap's original post office building. The 39-room hotel was completely reinvented in 2012 as the ultimate chic bolt-hole we see today, an achingly cool palette of muted grey tones, urban textures and tiling, punctuated by flashes of orange which are said to represent fleeting glimpses of the monks as they move through the temples. But Shinta Mani is more than just a startlingly trendy place to hang out, drink, sleep and yes, eat. While signature restaurant Kroya (which means ‘food’ in Khmer) features modern interpretations of classic Cambodian cuisine which can be eaten on one the four-seater suspended swings, the real coolness comes from the hotel's not-for-profit foundation - there are 22 students in the Shinta Mani hospitality training program and each graduate from the last 10 classes now has a job in the industry. And it doesn't stop there, ever a part of the community Shinta Mani identified the fact that 90% of the products sold to tourists aren't made in Cambodia, and launched the Made in Cambodia project giving guests the chance to visit a monthly street market right outside where Cambodian artisans sell only the highest quality locally hand-made merchandise. Jaillan has also written about 10 Stylish Things to do in Siem Reap for anyone feeling 'templed out' while in Cambodia. Take a look at our flights to Cambodia if you're thinking about a trip to Siem Reap. If you would like to book any of these hotels, speak to a travel consultant on 0208 045 4186.